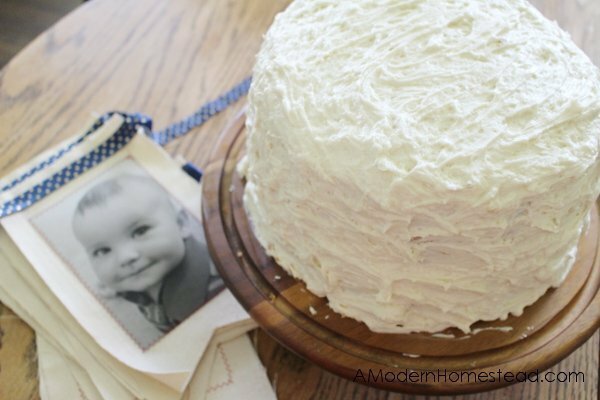 If you can believe it, I had never tried to make an honest-to-goodness einkorn birthday cake. That is, until my son decided he would turn one (he didn’t ask me if it was ok!). Oh sure, I’ve made many cakes like this $4 chocolate cake I made for my husband’s birthday. 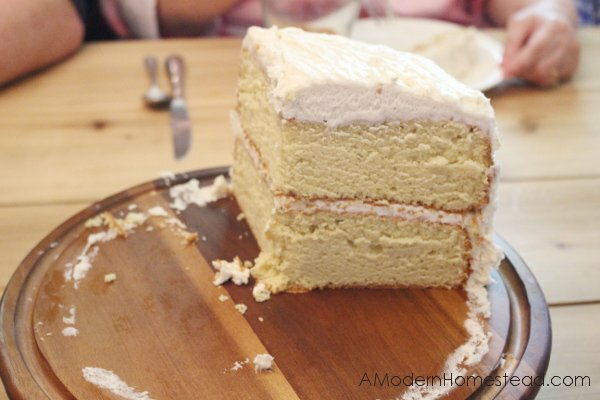 But even without birthday cake experience, I plunged forward and tried it… and the results were amazing! 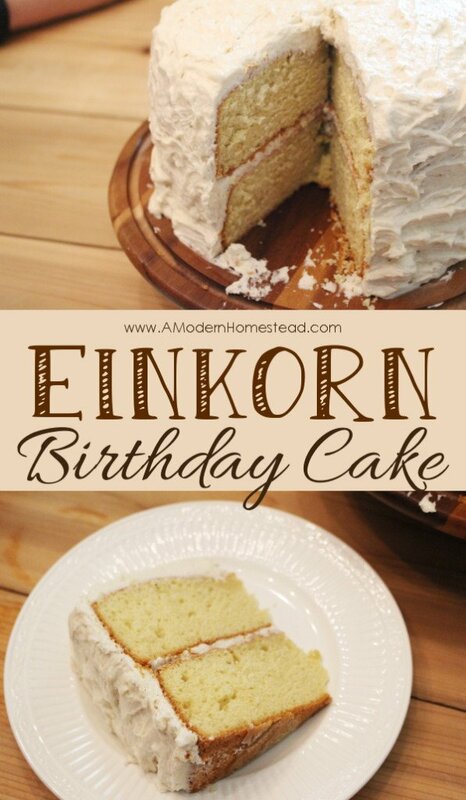 Here are the step by step instructions for how to make your own Einkorn birthday cake! 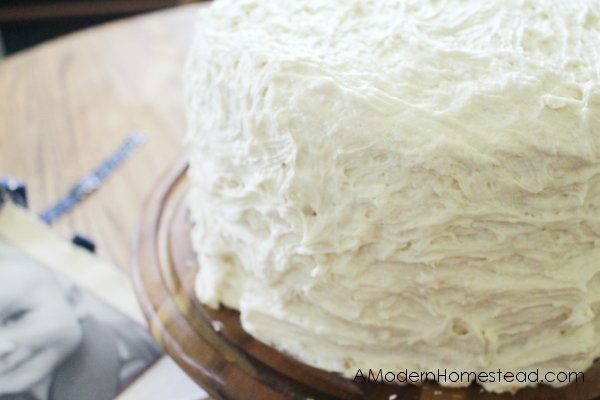 A light and fluffy white cake with homemade butter cream icing. Reading over this recipe, you may think it seems a little overly complicated or finicky. It’s honestly not. 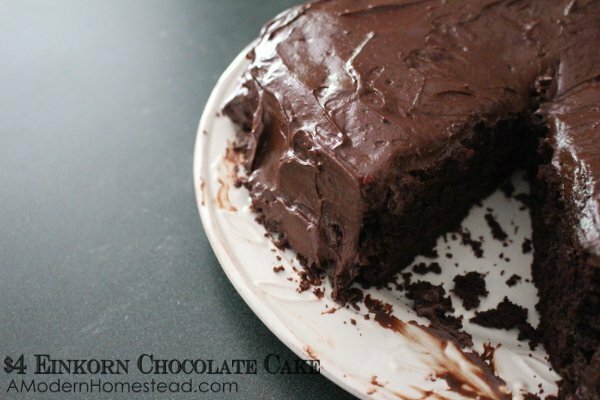 It may be a little different from other cake recipes you’ve tried, but trust me… it’s worth it! Because the thing about Einkorn is that it just doesn’t act the same way that regular flours do, which is a really good thing! 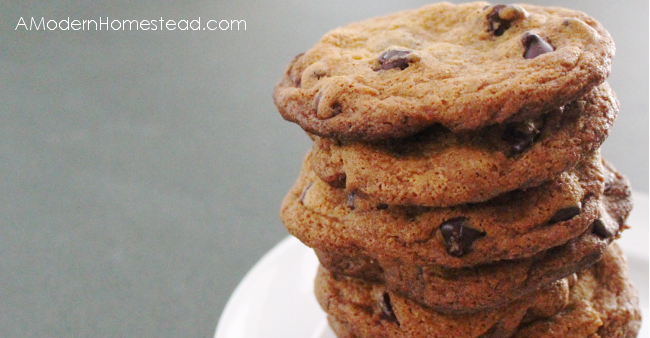 Read about why I love (and exclusively use) Einkorn Flour here. 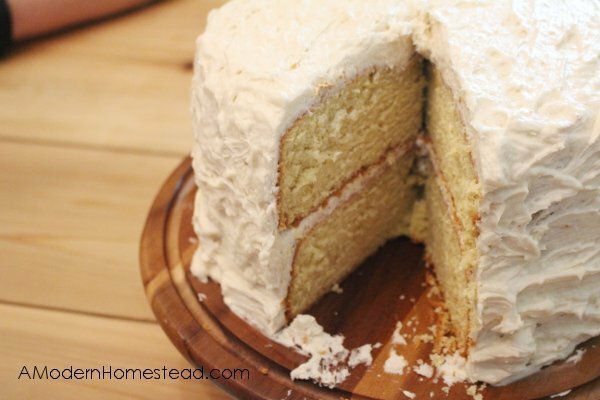 This recipes makes a reasonably sized cake, but don’t be afraid that it won’t feed your crowd. My family is the biggest bunch of cake eaters you can imagine, and there was still plenty left over after the 15 adults had eaten a slice! 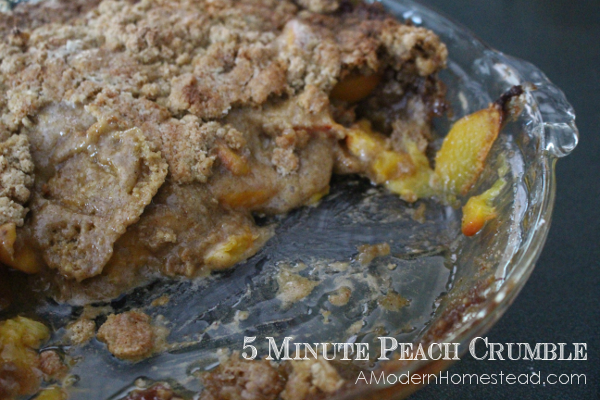 It’s so rich that even we had a hard time finishing the slices we originally thought were small! This is how much was left after all the adults (and 3 kiddos) had eaten their fill! Butter two tall, straight-sided cake pans. I used 8 inch pans, but you could use 9 inch or even a square or rectangular pan… just make sure it has high sides! Once your pans are buttered, dust with flour. Be sure to remove the excess flour! In your mixer, cream the butter and sugar until light and fluffy. I creamed the butter alone until very smooth before adding the sugar, then beat on med-high for another 5 minutes. Add in the eggs, one at a time, mixing well until each is incorporated. Add the vanilla extract to the milk. Alternating between the dry ingredients and the wet ones, add to the butter and sugar. Mix until combined after each addition. Beginning and ending with the dry mix works best! Using a spatula (not your mixer), gently fold in the egg whites. Stop when the egg whites are combined, but not completely incorporated. Pour the batter evenly into your pans. Bang the cake firmly on the counter (keep pan flat) to make sure there are no air pockets. 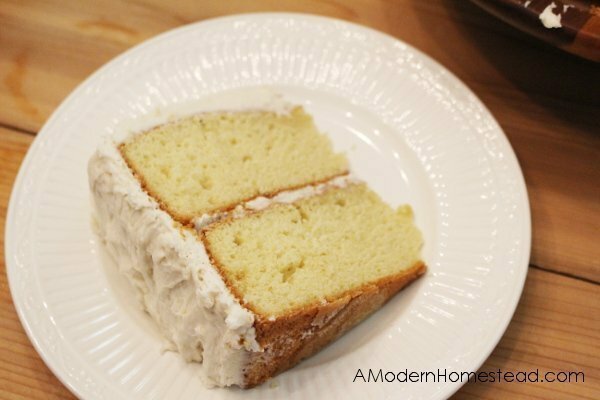 Bake for 40 to 45 minutes or until a toothpick cake comes out clean. Place butter in mixer and whip until smooth. Slowly add sugar - about a half cup at a time. Scrap down the sides often. Mix until all is well combined. Make sure that cakes are cool before icing. Hi Bonnie! Oh I’m so glad y’all love this recipe! For cupcakes, I usually just bake for 25 minutes at 350, then test to see if done. 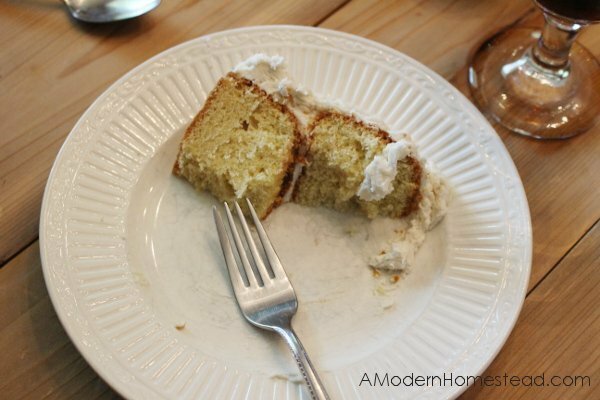 For my buttercream without powdered sugar, this is my favorite recipe! 1. Gently heat water just enough to disolve gelatin. Stir well, remove from heat and allow to come to room temp. 2. Beat butter until creamy and smooth, add honey. Slowly add water/gelatin mix and beat until light and fluffy. Note: You will need to scrap down the sides often, and I have found that if I turn up the mixer to high and shield the edges with a towel (to avoid splashing) it takes about 5 minutes to incorporate the water. Keep at room temperature to pipe, pipes really well!